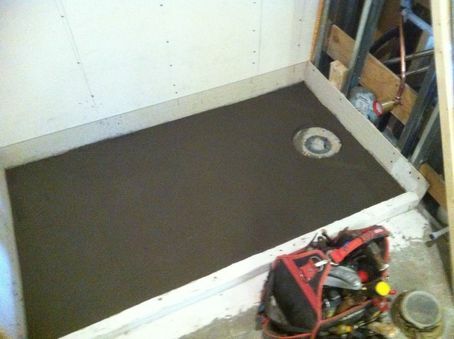 Here is a look at a steam shower floor we are building here in Vancouver. This project is just over the Burrard Street Bridge in False Creek. We are using Mapei's Mapecem Premix for are mortar bed and have build our shower curbs from Brick. With most conventional mortar beds you must wait twenty eight days before going further. The norm in the industry is to prepare a dry pack base and wait three days. With this Fast Setting Premix the techs at Mapei have engineered it to be ready for sheet membranes in 16-18 hours. Here is a link to the Mapecem Data Sheet - Data Sheet (Mapecem Premix). We mix this product by the book. A 40 pound bag needs just under 2.0 liters for a perfect mix and working with a Magnesium Trowel is preferred in my book over a wood one. Here are some pictures of the process. I have more on my Photobucket Site.